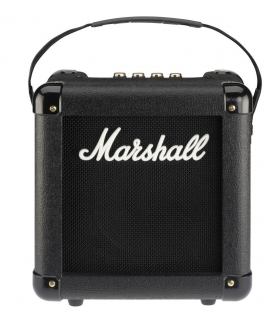 Harmony-Central–The MG15FXMS Micro Stack is the latest addition to the popular MG4 Series of Marshall amplifiers. The three-piece micro stack includes a 15-Watt compact head plus two matching speaker cabinets—one angled, one straight. Each cabinet is loaded with a full-range 10″ speaker. In addition to being highly transportable, the MG15FXMS also allows many entry-level and budget-conscious players to enjoy the look, feel, and classic tone of the iconic Marshall Stack. Preserving the best features of the MG4 series, the MG15FXMS provides a three-band EQ section and features four programmable channels—Clean, Crunch, Overdrive1, and Overdrive2—to provide a wide range of tone colors from a single amplifier. The Gain, EQ, Volume, and Master Volume knobs are presented in Marshall’s tried-and-true layout for extreme ease of use. Push-button channel switching offers smooth, silent transitions. The MG15FXMS Micro Stack provides a versatile array of inputs and outputs. The Line Input allows players to jam along with an MP3 player, CD player, or other source. The combination Line Out / Headphone Out features speaker cabinet emulation, so the full Marshall sound is always preserved when recording or practicing through headphones. The optional STOMPWARE® footswitch provides seamless transitioning from sound to sound, as well as tap tempo control and display for the built-in tuner. STOMPWARE technology allows this multi-function pedal to be connected using a traditional guitar cable—eliminating the need for special or hard-to-find cables. 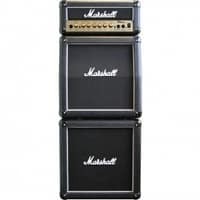 Visit marshallamps.com for more information.